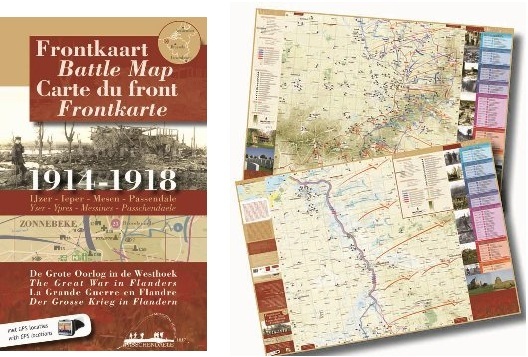 This battle map is the first to bring a complete overview of the heritage of the first world war in Flanders, from Nieuport to Plugstreet. A new terrain survey, combined with the analysis of ancient trench maps, results in a precise positioning (in time and space) of front lines, military operations and inundations. Over 220 memorials, 170 war grave sites, all publically accessible bunkers and trenches, memorials and demarcation stones, mine craters,... are accurately located on the map. The complementary quadrilingual search-index (with GPS locations!) enables to locate each battlefield site and to get information on it. The projection on a present day base map, with museums, tourist information centres, visitor and documentation centres added, makes this battle map an indispensable instrument for visiting the battlefield region. The Battle Map consists of a folded map and a visitor’s guide. Both are complementary but can also be used separately. They intuitively refer to one another by colour usage and through symbols. 1. The Map shows the precise location of war sites. A specific symbol makes clear to which category a site belongs, the numbering refers tot the search index in the visitor’s guide. Memorials and cemeteries get an additional indication specifying their nationality. Also indicated on the map are the exact positions of the front lines, front line movements, offensives, battles and the inundations. By means of colour usage (each important period has a separate colour) the chronology of the events is shown in a very comprehensive way, so that one can easily follow the course of the war. 2. The visitor’s guide contains an extensive and well structured list of all battlefield sites. The list is subdivided into 3 main categories (memorials, war graves, battlefield sites), corresponding with the symbols on the map. The Memorials category is further subdivided by means of nationality, and it is specified in honour of which unit, person or event the memorial was erected. The War graves category is further subdivided by nationality and location of the graves. For each cemetery, the number of graves is mentioned. For individual grave, the name of the soldier, his unit and (if available) the data of death are added. All battlefield sites in the list are sorted logically per category. For each site, name and address (street and city) are added. The grid box reference and the numbering refer to the location of the site on the map. summary of sites most recommended for a visit.